A blue, blue, bluebird day. Photos by Kim VanderVoort. There's Vail, there's Aspen, there's Breckenridge, and then there's Telluride. 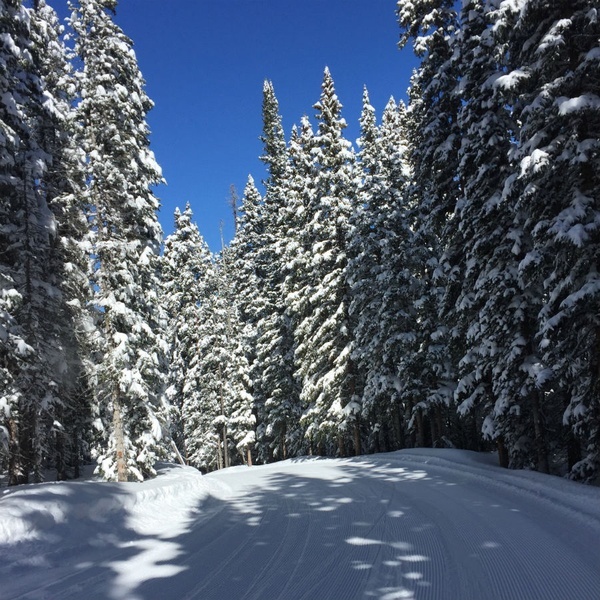 Popupla's Kim VanderVoort learns why this Colorado ski destination is in a class all its own. 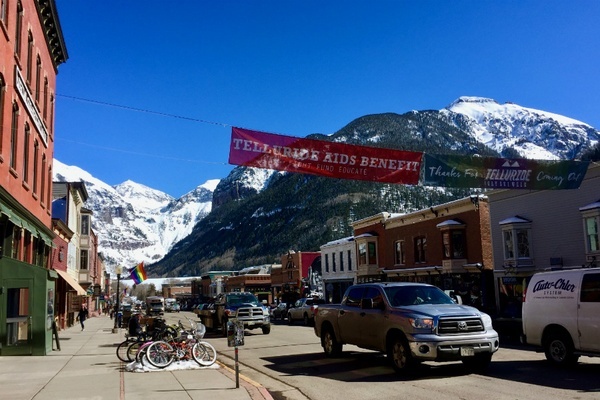 TELLURIDE, Colorado – I learned many things about Telluride, a magical place full of magical people. Namely, 1) I am a fair-weather intermediate skier; 2) if you get back up fast enough, no one has to know you fell; 3) the term "powder" is not a bro-y euphemism for snow. It has a very specific meaning, and is a force to be reckoned with. I arrived in Telluride to a brewing storm one evening, and by the next morning, the snow gods had bestowed 19 inches on the slopes. We had 22 by the afternoon. The town was absolutely abuzz with talk of the storm and all the fresh pow, as it were. Abiding by "powder day rules," many local businesses gave employees a few hours off to hit the slopes. We had all day. Heading up the gondola during the snowfall. A powder-neophyte myself, I overestimated my ability to stay upright in such fluffy conditions. I won't lie, I panicked. My body, entering distress mode, immediately erased all the ski-related muscle memory I had accrued. After one run down a powdery slope with expert skiers (read: behind expert skiers), the group and I made the mutual decision that we'd all feel safer if I hopped in a lesson. You know, for the safety of other skiers. 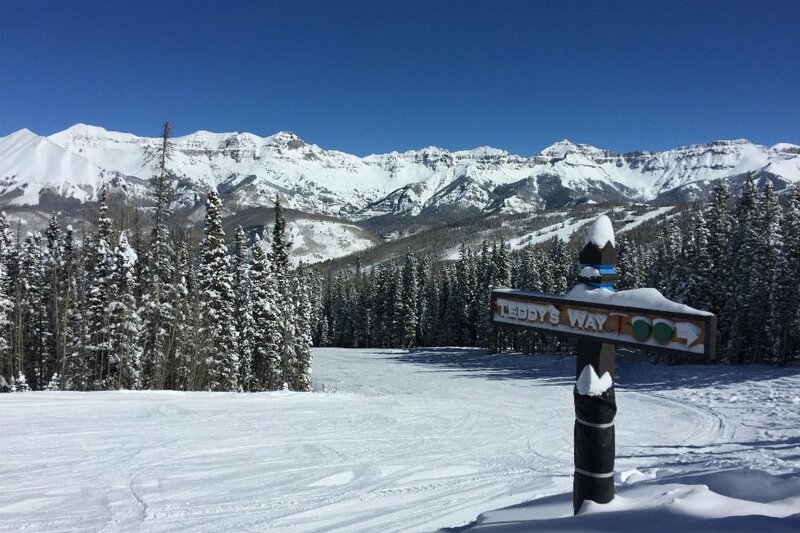 But the joke was on them (not really) because … Telluride Ski School was awesome! They assessed everyone's level individually and placed us in small groups. I was in Ski Instructor Dave's group. I made friends — we skied together, we ate together, we cried together, we laughed together. Dave smuggled me a hot chocolate at lunchtime. It felt like camp. Thank you, Ski Instructor Dave, for helping this fledgling skier take flight. My pasta and my tenderloin at Rustico. Needless to say I was exhausted and starving by the time dinner rolled around. 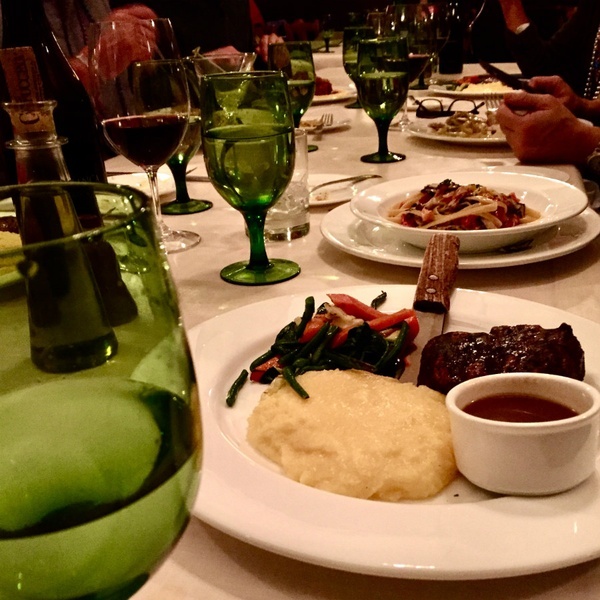 We were booked at , a classic, intimate Italian bistro right in town, where fireplaces glowed, hundreds of wine bottles lined the walls, and cheeky Italian waiters guided us through the menu. I couldn't decide between homemade pasta and sustainably-sourced beef (Rustico is one of three restaurants in the U.S. that sources meat from Ralph Lauren's Double RL Ranch down the road in Ridgeway), so I ordered both. No guts, no glory. I woke the next day to a bluebird day for the ages. 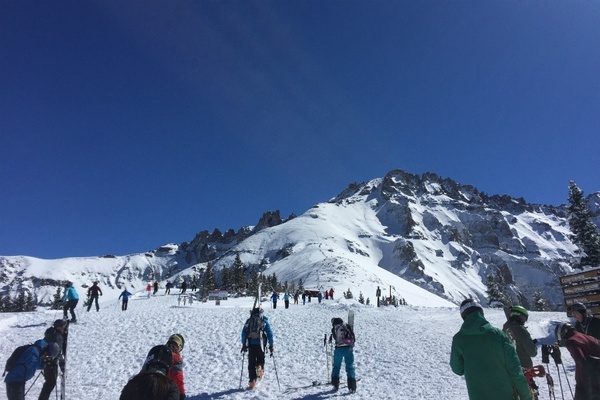 My crew headed up to Telluride's killer hike-to terrain, including 13,320-foot Palmyra Peak with its awe- and fear-inspiring 2,000 vertical feet, the natural beauty of which this skier enjoyed from a great, great distance. 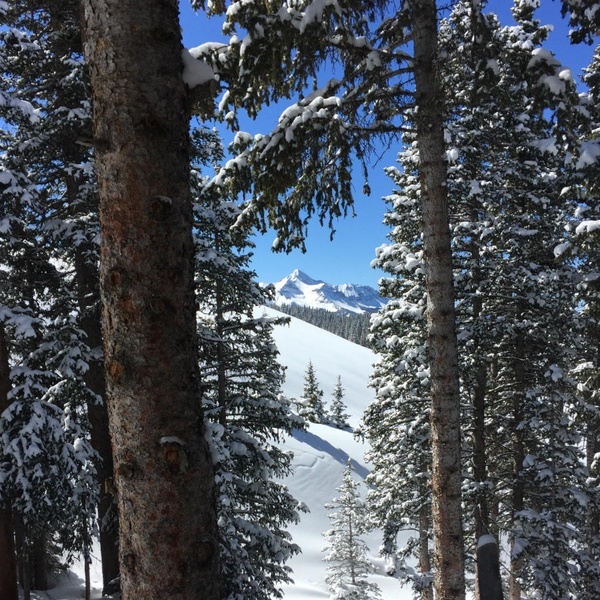 Having finally hit my stride, I took full advantage of the freshly-groomed blue trails and explored all the intermediate-level in-bound glade skiing Telluride has to offer. I believe the term is "shredding the gnar." Before the wind blew all the snow off the pines. Hikers begin their trek up to Palmyra Peak. I pulled myself out of my reverie just in time for a special expedition, first on skis, then on foot hiking off-trail, and finally by snowmobile, to Alta Lakes Observatory. Wilson Peak (on the Coors Light can) as seen from the deck of Alta Lakes Observatory. is the stuff of legends, of epic wilderness adventures, of Nordstrom winter catalog covers. In its most essential form, it is simply a vacation home far off the beaten path where people come to get away, earning its fancy name from its proximity, at 11,300 feet, to the stars. Built in the '70s on an old silver mining claim purchased by a group of Vietnam vets, the cabin has served as a venue since the '80s. It quickly became a local institution — everyone in town knows about the Observatory. Telluride resident Matt Bowling and his brothers purchased it in 2011, making some well-placed improvements while maintaining the spirit of this special place. Wanderers come from all over to work (and ski) there, keeping it running for guests, just to be a part of it. From my spot on the chalet's deep leather couch in front of the huge sunken fireplace, with views only of snow-covered evergreens and 360 degrees of peaks, I listened intently to Matt's jovial retellings of guest celebrations past. We only stayed for lunch just to check the place out (our guide for the week had the "in"), but I told Matt I'd already reached out to friends who might want to book a stay with me, and I wasn't lying. A hop, skip, and a snowmobile later, we were back on the mountain, skiing down to the gondola stop in Mountain Village. We had to ride it back downtown so we could de-gear and dress for dinner, which would be yet another trip back up the gondola, but I didn't mind. The Telluride-Mountain Village gondola is celebrating 20 years as the only public transportation system of its kind in North America. 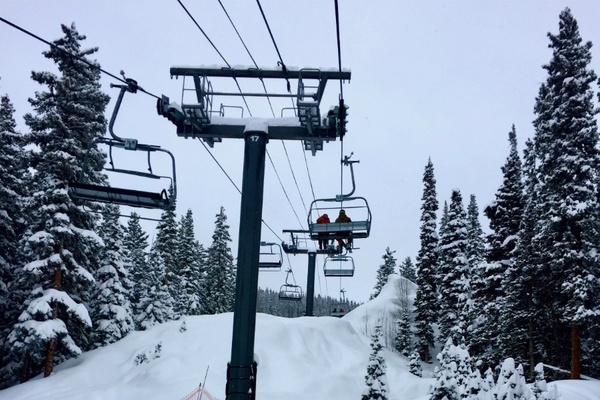 By eliminating the eight-mile drive between "uptown" (Mountain Village) and "downtown" (Telluride), the beloved lift saves about 45,000 tons of carbon dioxide vehicle emissions. The scenery's not so bad, either. Allred's, inside and out. Photo courtesy of Allred's. So up the gondola we went, stopping at the halfway point for dinner at , the highest year-round restaurant in North America at 10,500 feet. I puzzled over our 5:30 p.m. reservation, but as we rose in our cab, I saw the sun setting over the mountains, a rosy alpenglow painting the peaks, and I understood. 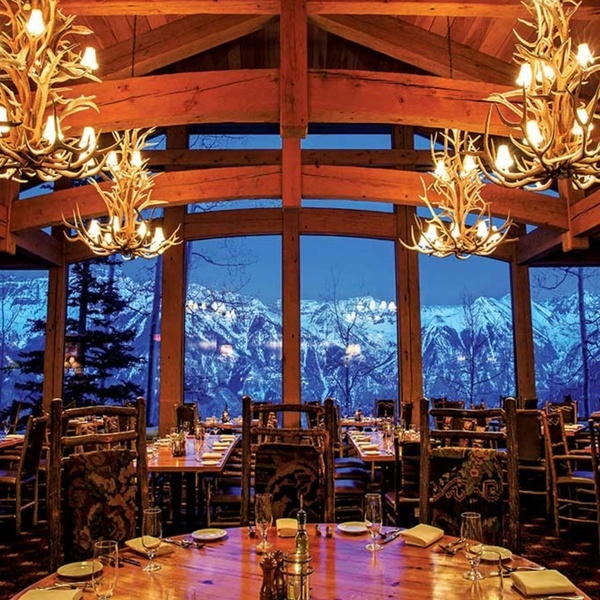 The view from Allred's was no less stunning, where floor-to-ceiling windows overlooking the mountains are the main attraction — it wasn't until it was completely dark outside that my attention turned to the sophisticated hunter's lodge decor (wood paneling, antler chandeliers) and the impressive wine list. I ordered the beef tenderloin. When in Colorado. Never in my life have I turned down a historical tour of any kind. Telluride was no different. I'm a sucker for small-town facts and folklore and, on my last day out there, I just couldn't help myself. Jack-of-all-trades resident Ashley Boling was my guide, and he was every bit the perfect local enthusiast. I was utterly charmed by the freestanding car of the now defunct Galloping Goose (a scenic passenger train once more popular than the Grand Canyon), the (originally the Sheridan in 1895, it's been the New Sheridan since the owners rebuilt it after a fire … in 1898), and the site of the first bank Butch Cassidy ever robbed. Even more charming, however, were Ashley's stories about sitting on the jury in such a small county and guiding rafting trips in the summertime, and his asides to local friends we passed (the town's entire constituency, judging by the frequency). In a small town at the base of a world-class ski resort, I was happy to learn that the culture here is centered as much around the community as the mountain. The thought I couldn't shake? I could live here. "Telluride: come for the winter, stay for the summer" was a phrase I heard over and over. After hearing tales of white water rafting trips, countless hiking trails, and the swath of wildflowers that bloom in August, I promised myself I'd made it back for a Telluride summer. As if I needed another reason to come back. Telluride Airport is teeny-tiny, so most people fly into Montrose airport and book an hour-and-a-half shuttle (like ) into town. I stayed at , which was a great home base for my action-packed days, especially with the SUV shuttle that runs in and out of town on demand. 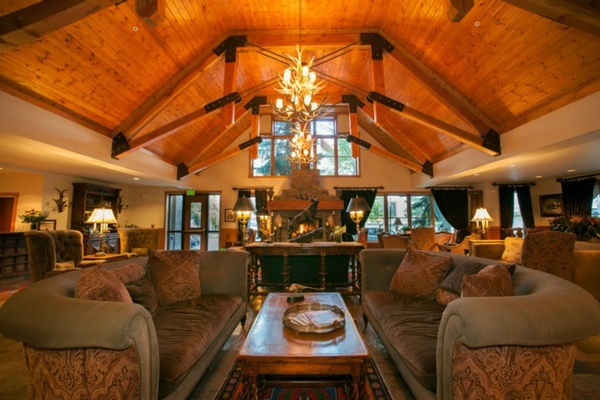 The cozy lobby was very Colorado Chic: big fireplace, mossy green- and chocolate-colored upholstery, miniature iron elk statues, antler chandeliers. I was particularly grateful for the ever-present coffee/tea station in the lobby and the humidifier in my room. I booked a massage on my last day — a fantastic decision. Snow boots for walking around town. Otherwise, has everything available for rent or purchase, and the staff is exceptionally helpful. Don't forget sunscreen — I'm already missing Telluride to death, but I won't be missing my goggle tan.